A pilfered 16th-century masterpiece has been returned home—sort of. 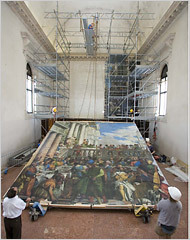 A digital recreation of Veronese‘s Wedding at Cana has been installed on the Venetian Island of San Giorgio Maggiore, from where it was taken by Napoleon’s forces 210 years ago. Wedding at Cana‘s home for the last two centuries, the Louvre, was the site of a monthlong scanning process of the 732-square-foot canvas. Nearly 1,600 digital files were printed out repeatedly until the color quality was sufficient. A New York Times article said matching the original colors was particularly difficult because the painting was restored a number of times, with the pigments used reflecting contemporary tastes. “I think [Veronese would] be shocked to see it in the Louvre — though mollified, perhaps, by the fact that nine million visitors pass in front of it each year,” Mr. Lowe said.